The Spring 2017 issue of Connections presents hybrid warfare in the experience of Ukraine, with examples and ideas how the country can better organize to deliver advanced technologies to the warfighter. 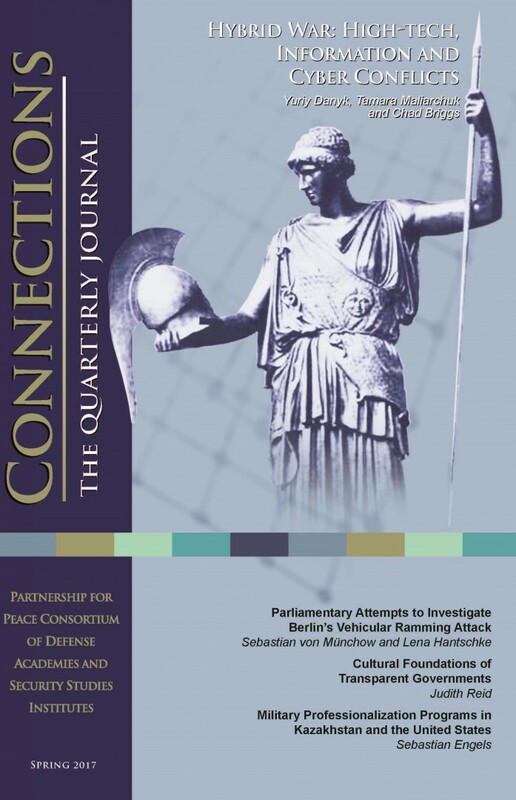 Other contributions examine the effectiveness of parliamentary investigations of terrorist attacks, drivers and inhibitors to IS spillover, and potential measures NATO can take in view of climate change. The last two articles look into security cooperation, presenting respectively the need to account for the cultural context in defense institution building programs and drivers for success in the U.S. security cooperation with Kazakhstan. Engels, Sebastian. "Military Professionalization Programs in Kazakhstan and the United States: How to Implement and What Will We Gain?" Connections: The Quarterly Journal 16, no. 2 (2017): 91-104.